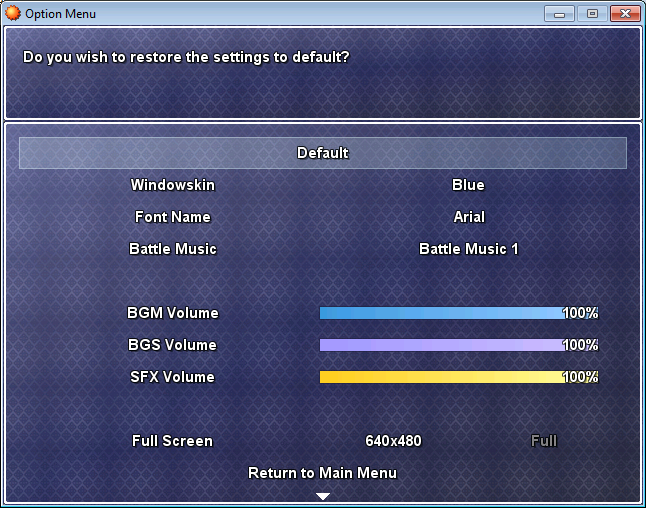 This script replaces the “Game End” option in the Main Menu altogether and giving the player some familiar options seen in many of today’s commercial RPG’s such as changing window skins, adjust sound volume, turning off animations during battle, and the like. Allows the player to adjust the setting in the game. Has a Default feature to restore everything. Script Calls – These commands are used with script calls. Use the script call to change the bgm, bgs, or sfx sound rate by x increment. Use a negative value to lower the volume. $game_system.volume_change(:sfx, x)Turns autodash on (true) or off (false). $game_system.set_autodash(false)Turns Full Screen on (true) or off (false). 1.Scroll down, adjust the various Variable values to something empty or predetermined. 2.Go to the Windowskin folder in your project’s “Graphics” folder to insert the window skins you want to use there and adjust the WINDOW_HASH accordingly. Do the same with the Battle Music by going to your BGM folder in your project’s Audio folder and then adjust the MUSIC_HASH in the module. ForeverZer0, for fixing the line break issue. KK20, for fixing the issue with the fullscreen. Remove lag when selecting font or windowskins, when the Warrior Core Engine is installed. ● Added a comfirmation when trying to click on default.